Throwing money at a problem doesn’t make it go away. Social engineering methods and the ‘evil genius” cyber criminals behind the attacks are furiously innovating, keeping IT off-guard. Attackers are moving their focus from attacking the hardened network perimeter to attacking your users. This has made Ransomware and CEO Fraud incidents skyrocket, costing billions of dollars in losses. How do you keep up and what are the most effective methods for securing your organization to combat cybercrime? This webinar will cover the ransomware and CEO Fraud epidemics and proven methods of protecting your organization against these phishing-based attacks, like creating a “human firewall”. Get an exclusive look into the results of the CSO 2018 US State of Cybercrime survey, with moderator Bob Bragdon, SVP and Publisher of CSOonline.com. 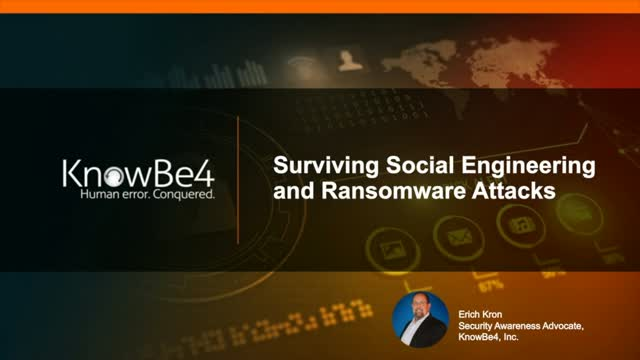 Join Bob and guests from the U.S. Secret Service, the Software Engineering Institute at Carnegie Mellon University, and and KnowBe4, a leading security awareness training and simulated phishing provider. This lively and revealing discussion examines the latest 2018 cybercrime findings, including: the number of security events, major causes, and their impact; what CIOs and CSOs can do to better secure their organizations; and a close-up look at the state of security awareness training.